The King's disputes with the English Parliament grew into the English Civil War. James accompanied his father at the Battle of Edgehill, where he narrowly escaped capture by the Parliamentary army. He subsequently stayed in Oxford, the chief Royalist stronghold, where he was made a M.A. by the University on 1 November 1642 and served as colonel of a volunteer regiment of foot. When the city surrendered after the siege of Oxford in 1646, Parliamentary leaders ordered the Duke of York to be confined in St. James's Palace. Disguised as a woman, he escaped from the Palace in 1648 with the help of Joseph Bampfield, and crossed the North Sea to The Hague. James's wife was devoted to him and influenced many of his decisions. Even so, he kept mistresses, including Arabella Churchill and Catherine Sedley, and was reputed to be "the most unguarded ogler of his time." Anne Hyde died in 1671. James's younger daughter Anne succeeded to the throne when William III died in 1702. 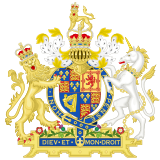 The Act of Settlement provided that, if the line of succession established in the Bill of Rights were extinguished, the crown would go to a German cousin, Sophia, Electress of Hanover, and to her Protestant heirs. Sophia was a granddaughter of James VI and I through his eldest daughter, Elizabeth Stuart, the sister of Charles I. 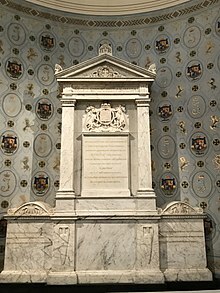 Thus, when Anne died in 1714 (less than two months after the death of Sophia), the crown was inherited by George I, Sophia's son, the Elector of Hanover and Anne's second cousin. Hilaire Belloc, a writer and Catholic apologist, broke with this tradition in 1928, casting James as an honourable man and a true advocate for freedom of conscience, and his enemies "men in the small clique of great fortunes ... which destroyed the ancient monarchy of the English." However, he observed that James "concluded the Catholic church to be the sole authoritative voice on earth, and thenceforward ... he not only stood firm against surrender but on no single occasion contemplated the least compromise or by a word would modify the impression made." By the 1960s and 1970s, Maurice Ashley and Stuart Prall began to reconsider James's motives in granting religious toleration, while still taking note of James's autocratic rule. Modern historians have moved away from the school of thought that preached the continuous march of progress and democracy, Ashley contending that "history is, after all, the story of human beings and individuals, as well as of the classes and the masses." He cast James II and William III as "men of ideals as well as human weaknesses." John Miller, writing in 2000, accepted the claims of James's absolutism, but argued that "his main concern was to secure religious liberty and civil equality for Catholics. Any 'absolutist' methods ... were essentially means to that end." "Though a libertine, James was diligent, methodical, and fond of authority and business. His understanding was singularly slow and narrow, and his temper obstinate, harsh, and unforgiving. That such a prince should have looked with no good will on the free institutions of England, and on the party which was peculiarly zealous for those institutions, can excite no surprise. As yet the Duke professed himself a member of the Anglican Church but he had already shown inclinations which had seriously alarmed good Protestants." 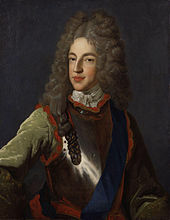 Whilst His Majesty was still Duke of York and of Albany, he was illicitly associated with Arabella Churchill, the Duke of Marlborough's sister. I thank you, sir, for your information. He was not created Duke of Marlborough until 1702. Thus, I should have referred to him as "John Churchill," sir. I apologise. James Duke of York, afterwards King James II. 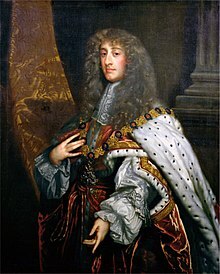 He was born 15th October, 1633; succeeded his brother 6th February, 1684-5; abdicated the crown in 1688; and died 6th September, 1701. Bishop Burnet's character of him appears not very far from the truth. -- "He was," says this writer, "very brave in his youth; and so much magnified by Monsieur Turenne, that till his marriage lessened him, he really clouded the king, and passed for the superior genius. He was naturally candid and sincere, and a firm friend, till affairs and his religion wore out all his first principles and inclinations. He had a great desire to understand affairs: and in order to that he kept a constant journal of all that passed, of which he shewed me a great deal. The Duke of Buckingham gave me once a short but severe character of the two brothers. It was the more severe, because it was true: the king, (he said,) could see things if he would: and the duke would see things if he could. He had no true judgment, and was soon determined by those whom he trusted: but he was obstinate against all other advices. He was bred with high notions of kingly authority, and laid it down for a maxim, that all who opposed the king, were rebels in their hearts. He was perpetually in one amour or other, without being very nice in his choice: upon which the king once said, he believed his brother had his mistresses given him by his priests for penance. He was naturally eager and revengeful: and was against the taking off any, that set up in an opposition to the measures of the court, and who by that means grew popular in the house of commons. He was for rougher methods. He continued many years dissembling his religion, and seemed zealous for the church of England. But it was chiefly on design to hinder all propositions, that tended to unite us among ourselves. He was a frugal prince, and brought his court into method and magnificence, for he had 100,000l. a-year allowed him. He was made high admiral, and he came to understand all the concerns of the sea very particularly." The Life of James The Second King Of England Collected Out Of His Memoirs And Writ Of his Own Hand Together With The Kings’ Advice To His Son and His Majesty’s Will. J.S. Clarke, historiographer to the King, London 1816. “ have struggled with greater Difficulties than King James the Second, and few ever sustained a greater load of trouble afterwards. Yet the Difficulties he had to struggle with have not always been sufficiently considered by Historians, nor does it appear that the essential and lasting service which James rendered to this Country in compacting and as it were building up its Naval Power has been sufficiently weighed: It is not generally known the Naval regulations now in force are taken almost verbatim from those which he established, or that when lately the Board of Naval Revision wished to add to and improve the Naval Regulations, they sent out for Papers of Pepys, the Marine Secretary of James, as being the best materials whence they could obtain the object they had in view…. James thoroughly understood the whole business of the Admiralty, and knew also the disorders which had crept into the whole economy of the Fleet, in the six years immediately preceding his Accession. This fact is amply corroborated by the honorable testimony of Mr. Secretary Pepys in his Memoirs: the excellent methods there recorded, by which James regenerated the Naval Power, clearly shew how well he understood it on all its bearings. The following were the Qualifications [ as set forth in Pepys Memoirs, date /page not specified] which during that Monarch’s reign were required from every one, who occupied a place in any branch in the Naval Department. 1. A Practiced Knowledge in every part of the Works and Methods of your Navy, both at the Board and in your Yards. The not discerning of which and the others that follow, (adds Mr. Pepsys in addressing James the Second,) appears to have cost your Royal Brother and You within the fore-mentioned five years, above half a million. 2. A General Mastery in the business of Accounts, through more particularly those incident to the Affairs of Your Navy. 3. Vigour of Mind, joyn’d with approve’d Industry, Zeal, and Personal aptness for Labour. 4. An entire Resignation of themselves and their whole time to this Your Service, without lyableness to Avocation from other Business of Pleasure. 5. Lastly, Such Credit with your Majesty for Integrity and Loyalty, as may (with the former conditions) lead both your Self and My Lord Treasurer, to an entire confidence of having all done that can be morally expected from them, in the Advancement of your Service, and the circumspect and orderly dispensing and Improving of your Treasure. 1. That Integrity, and general (but unpracticed) Knowledge, are not alone sufficient to conduct and support a Navy, so as to prevent its Declension into a state little less unhappy than the worst that can befall it under want of both. 2. That not much more (Neither) is to be depended on, even from Experience alone and Integrity, unaccompanied with Viguor of Application, Assiduity, Affection, Strictness of Discipline, and Method. 3. That it was a strenuous Conjunction of all of these (and that Conjunction only) that within half the time, and less than half the charge it cost the Crown in the exposing it, had (at the very instant of its unfortunate Lords’ withdrawing from it) raised the Navy of England from the lowest state of Impotence, to the most advanced step towards a lasting and solid Prosperity, that (all circumstances considered) this Nation had ever seen it at. And yet not such, but that (even at its Zenith) it both did and suffered sufficient to teach us, THAT THERE IS SOMETHING ABOVE BOTH THAT AND US THAT GOVERNS THE WORLD, TO WHICH (INCOMPREHENSIBLE) ALONE BE GLORY. Such were the Principles and Maxims which James the Second established, whose interesting Commentaries on what had passed before him both as a Prince and A Sovereign, are now given in these Volumes to the Public through the liberal condescension of His Royal Highness The Prince Regent” ( pages xxvi –xxix). Two other areas of interest, which are included along with James’ life in these volumes are available online. Both of these are the letters of “advice” from Father to Son, first that from Charles I to Charles II and then from James II to his son James, exiled along with him in France. “The Advice which James the Second Bequeathed to his Son James, Generally known by the Name of The Chevalier de St. George” can be found at the link below. This version has been “modernized” in terms of spelling and has quite a few typos, but it was the only online copy I could locate. The overall document is accurate against the version in this book. The Duke on the fiddle? In 1663 for the English to trade with Brazil a licence was needed and security given to return via Portugal. The Duke did not quibble about the necessity. Charles lent him three royal ships to trade with Brazil. An English merchant in Lisbon undertook to freight them, on condition that the Duke manned and victualled them for twelve months at a cost of £14,000. Fanshawe told Coventry that tha Duke stood to be richer by £6-7,000 as a result of the investment. A considerable sum at that time. "At the Restoration of the monarchy in 1660 Cooper’s reputation as the foremost artist in England secured him the patronage of the returned royal family, to which he responded with an enriched style. His flesh painting became more full bodied, noticeably so to contemporaries such as Samuel Pepys, who thought ‘the colouring of the flesh to be a little forced’. Today, albeit with fading, this portrait of the Duke of York does not seem unnaturally sanguine. Overall the effect is less austere than Cooper’s style during the Commonwealth period, the lighting less dramatic and so the relief of the sitter’s features is less marked. Its softer, lighter style, however, does not lessen the dignity and presence of the sitter. 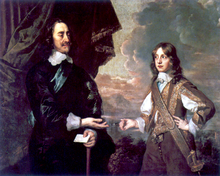 The Duke particularly retains a serious reserve appropriate for the second son of the ‘martyred’ Charles I." The duke of York, though he had a quick relish for pleasure, followed business with that closeness of application which the king his brother wanted; and wanted himself that quickness of apprehension, that natural sagacity and apparent benevolence of temper, which was so conspicuous in the king. His notions of government were as erroneous as those of his father and grandfather; and the large steps which his brother took towards arbitrary power, were in a great measure owing to his instigation. He was, what rarely happens, revengeful and valiant almost in the same degree; and displayed such courage in the first Dutch war, as rendered him more popular than all the other acts of his life. His bigotry to the Roman Catholic religion, which was still encreasing with his years, had the strongest influence upon his conduct; and at length prompted him to such measures as were condemned by the sober and judicious of all religions. 1633-1701. King of England, King of Scots, and King of Ireland from 6 February 1685 to 11 December 1688. He was the last Roman Catholic monarch to reign over the Kingdoms of Scotland, England, and Ireland. James is best known for his belief in absolute monarchy and his attempts to create religious liberty for his subjects.